If I had the money I would drop so much on this website. I'm 100% lusting over these Jefferey Campbell So Smart Wedge in Dusy Pink...and I guess so is every one else since it is sold out on Nasty Gal's website! I'm also totally loving the Tied Sequin Dress ($98). It's prety much the ULTIMATE New Year's Eve party dress. 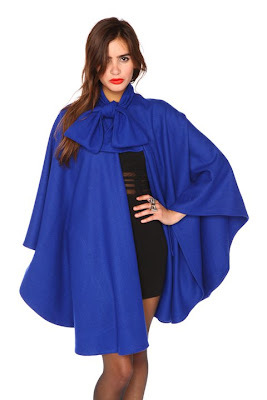 As soon I saw the Madeline Wool Cape I just went gaga! The bow and the color really make the cape. The color alone stands out! What do you think about their November new arrivals? Don't forget come LIKE my Facebook page! That fourth outfit/dress is amazing! Oh my gosh I need it! oh wow that sequin dress is amazing, I love the back of it too! want!!! oh that cape is just fabulous! that blue cape is something wonderful!